I recently shared with you my homemade gummy snacks and this is a version of the same recipe. To mix it up a bit, I made some with water and some with yogurt. If you want to make both types, start with the water version then make the yogurt recipe straight afterwards in the same saucepan. Place the Jello, gelatin and water in a saucepan and stir well. Heat over a low heat until the gelatin crystals have dissolved. Spoon into the pumpkin mold. Place all ingredients into a saucepan and stir well. Cook over a low heat until the gelatin crystals have dissolved. Spoon into molds and leave to cool. Without washing the saucepan, add both ingredients and stir well. As before, cook over a low heat until the gelatin crystals have dissolved. Fill the remaining cavities in the mold. As you can see from the picture, these recipes make 8 Jello gummies and 16 yogurt bites. Leave to cool, then place in the fridge for 2-3 hours or until set. 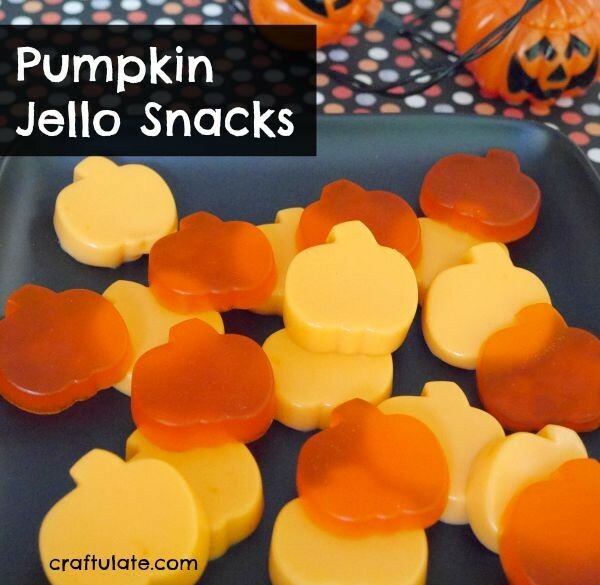 Gently remove the pumpkins from the mold and serve, or store in the fridge until required. We’ve never made these! We’ll have to try it! These turned out great. I need to get myself a pumpkin mold.